Graduated as an electrical engineer and worked as a research associate in the Mechanical Engineering department while working on my masters in physics at the Cameron Applied Research Center. This was were I learned precision machine design, how to machine and fabricate in metal and started learning how to weld. While working for Brown and Sharpe as an R&D engineer, I switched from the Engineering sector to the IT sector. At the time it was primarily financially motivated... at the moment I still think the IT sector is more lucrative. I think the true return would occur by combining both disciplines in the development of something that could be marketed and sold to the masses. 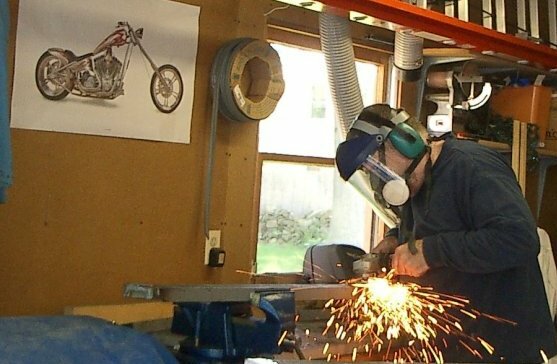 When I bought our house it was with the intention to setup my own machine shop. This shop is 30x30 feet, two stories, and is bigger then the actual house. I use it primarily for fabrication, repair and prototyping of projects. I prefer to have my projects funded by customers... but I do a far bit of pro-bono work if time allows and it stays fun. My ultimate job would be to spend all my time imagining, designing, fabricating and testing for customers. Please contact me via e-mail if you have any projects, questions or big ideas with matching budgets I can assist with.